This Saturday my family will be traveling to the Philippines for an 11-day trip. It will take us 40 hours to get there, including 3 flights (one leg is 15 hours) and a 10-hour layover in Hong Kong. When we go into Hong Kong I am planning on using my Moby Wrap and a messenger bag as my diaper bag so I can be hands free. I know I should feed on the way up and on the way down. We did get a seat just for her and will be using her car seat. We got a car seat stroller frame to carry the car seat through the airport. Also, I am still breastfeeding, so I won’t be carrying any bottles or formula. I will be bringing my very discreet nursing cover! I am also planning on bringing several sets of earplugs to pass out to my flying neighbors just in case. Hopefully they will appreciate the sentiment. 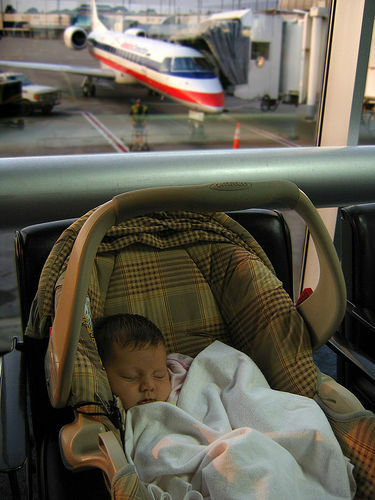 Do any of you have experience flying with a baby or handling baby jet lag? Do you have any tips or tricks? Start preparing to pack a few days before you travel. Keep a running list of things to take, or put items out on a table or dresser as you think of them. Use a diaper bag with a waterproof lining and a shoulder strap. Pack an extra shirt for yourself in your carry-on bag. Prevent leaks by packing medicines and toiletries in resealable plastic bags. Keep your baby’s outfits together in one suitcase so you can find them easily. Take your camera — and don’t forget the battery charger if it’s digital, or plenty of film if not. Take a clip-on reading light so you can read without disturbing your baby. This is GREAT! I know you’re going to be very organized on your trip! The first link on the bottom didn’t connect for me…???? we flew with jackson this summer. bring extra outfits. the baby changing station inside the bathrooms are VERY small…..if the plane wasn’t full I went to the back where no one was sitting and changed him. You could try that. Bring something of hers that is her favorite and seems “normal” to her. Example: blanket or toy. That helps a lot! Whoa…a 15-hour leg is a LONG time! I thought our 6-hour nonstop to Hawaii was long. You seem to have done your research and have everything covered Amanda. Caleb has flown 6 times and we’ve never had a single issue with him. I believe mainly due to his personality. Annabelle appears to be really laidback like my son, so I wouldn’t expect any issues to arise with her. Bring plenty to entertain her on the flight. If she’s begun watching any dvd’s geared towards infants like Baby Einstein, I would bring a portable dvd player. That’s a definite must whenever we travel. We fly back to Portland, OR next week for the holidays. This will be Ava’s 1st flight so I’m praying she’ll be as easy as her big brother. I’m not expecting a smooth flight like I would with you and Annabelle. Bring her favorite toy!! That are easy to pack and store since you are limited. We have flown with Brielle at 6 months and again at 8 months. Things to get her attention were my best friend. The only other thing that was hard on her was not being able to move a lot. Good Luck!! Oh…..you need anti-bacterial wet wipes! Don’t forget to take along a Downtime Sleepy hat – a new mom-made invention for helping babies fall asleep in difficult-to-do-so places….like when traveling. Check it out at http://www.downtimebaby.com. As a personal preference, I always use those lithium batteries for my camera as opposed to the rechargeable ones — they last forever, so you usually don’t have to worry about even changing them. You guys ROCK! Thank you so much for the tips. Sharon, I am so glad you commented this morning. I was about to go buy a new set of rechargeable batteries. I will get the lithium ones instead. I wasn’t sure how the voltage would work with the rechargeable ones anyway. I have Ace’s favorite toys ready and plenty of wipes! Someone else suggested anti-bacterial wipes too. Oh, and we are trying our best to travel light with only two travel-back packs and two messenger bags between the three of us. I am hoping the bag I am using for Ace is just right. I didn’t want a large one, because I would be tempted to stuff it. Thanks again for all the tips!! I recently completed a 24 hour trip with a nearly 6 month-old and it was much easier than I’d anticipated. The great thing about small babies is that they often sleep a bit on the plane, and yes, wrapping the baby to carry her was a life saver. Get the latest designer watches with a Watch Station coupon. Who&apos;s Your Favorite Celebrity Mom? Yo Gabba Gabba! is AWESOME! 36 Kid Friendly YouTube Videos that Won&apos;t Annoy You! Are you &apos;letting yourself go&apos;?